Chore charts for kids help kids become more responsible around the home. Parents can be clear about their expectations and help kids learn to become self-sufficient. As a busy mom of 5, when I use chore charts, I end up feeling less like a martyr who does everything and more like a coach teaching her young ones to be part of a community. I struggled with chore charts for my toddlers and preschoolers until I found this easy idea for chore charts from Raising Five. 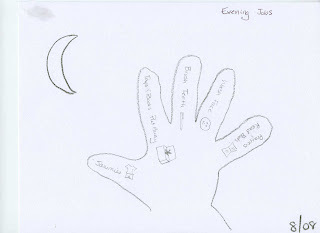 I love the idea – using fingers to help little ones remember their personal care jobs in the morning and evening. The kids loved tracing their hands and my little drawings to represent each chore. Katharine from Raising Five used 4 x 6 index cards to make her helping hands. After making mine on 8.5 x 11 cardstock, I think I’d like to use something in between, like 5.5 x 8.5. Something big enough to be seen and not lost, but not so big that it takes up a lot of space. Have each kid trace their hand twice. Use a sun for morning chores and a moon for evening chores. For the adult, write the chore for each finger. Then, for the kid, draw a picture for a visual reminder of the chore. Above are the helping hand chore charts that I did with my almost five year old. He was lead kid on the project. He helped pick the colors and the one word descriptions for the final version. I also did a set for my almost three year old and one for my 20 month old who likes to do everything that her brothers are doing. When we tried the chore charts yesterday morning, it was a bit chaotic with Dad being home on a week day, but I can see this working over time. We have the morning set posted on the fridge and the evening set posted on the bedroom doors upstairs. My almost five year old asked to bring his morning one with him while he did his “jobs” which is why I think a smaller piece of paper might work better. In my copious free time, I think I’ll have the kids do their hands again on smaller paper, do the jobs again and then scan them into the computer for backup in case we lose a card. 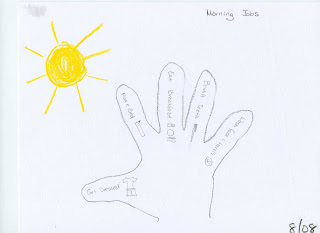 These “job” hands are part of a plan that I’m working on for my toddlers and preschoolers. Preschool classrooms use pictures and words to identify tasks and places to store stuff for the kids. These “communication” cards become a second adult in the classroom, but one that guides the kids and encourages them to do it themselves. My kids, even my 20 month old, are really enjoying the “hand.” It’s one of the best ideas I’ve found. After only a few days, we don’t need the picture, but it’s there as a reminder. Wham bam thank you, ma’am, my qusiteons are answered!